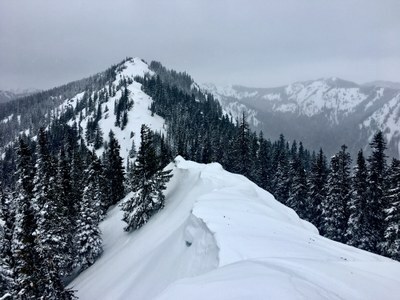 The route offers considerable protection when avalanche conditions are a concern. The parking area off the Easton frontage road (the same as for Baldy) was cleared and had room for a half dozen vehicles. After the usual road walk, a trail took us to the 3,600' jump off point, the ascent to the Pt. 4615 was up a forested slope and the way to Pt. 4884 was along a gentle ridge top. A continuation to Pt. 5194 would have required more stable snow conditions than were present. There was a hard crust a few inches below generally reasonable bound fresh snow surface. Mircospikes helped on the frozen lower portions of the trail. A near blizzard on the drive back added to the adventure.